So look at the bottle, which one are you trying to copy? If it’s Synergy, know that you will be adding about an ounce of juice or fresh fruit per 16 ounce bottle for more of a blend. If it’s GT’s Kombucha, the flavoring amounts will be less, often using dried barks, berries, or flowers to achieve the flavor, with the Kombucha taste more forward. 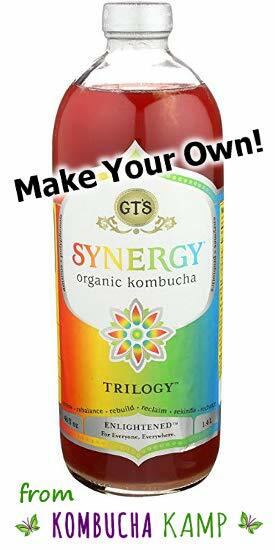 For example, if you look on the bottle of GT’s Synergy Trilogy Kombucha ingredients, it says the flavorings are raspberry juice, lemon juice, and ginger juice. We don’t know how much of each to use exactly. So while we don’t know the exactly GT’s Trilogy Kombucha recipe, we can take our best guess for a mix of juices and other elements to replicate the flavor at home! As always, for the best results and flavor, we recommend only organic ingredients. That is what GT’s uses, according to the label, and KKamp offers only organic ingredients as well. The type and quality of the tea will have a big effect on the brew. For the best base flavor, we recommend using Hannah’s Special Tea Blend for perfect Kombucha. However, you could choose to use any organic tea you like. A blend is best because it offers a balanced flavor. If trying to copycat GT Kombucha, we’ve heard that a half-and-half black/green mix is a good way to start, then adjust to find the taste you like. 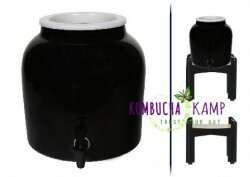 The choices of black and green teas is extensive, click here to learn more about teas to use when making Kombucha. 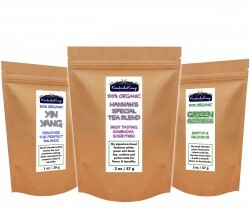 Or visit the selection of KKamp Organic Teas here. Using Fruit Instead of Sugar? GT is famously secretive about his process. But from reading the label, we can see kiwi juice is listed as the sugar source. Unfortunately kiwi juice is not readily available to consumers, at least not in a form that would be suitable for brewing. It’s a commercial sweetener which hasn’t caught on yet with consumers. So it’s perfectly fine to stick with quality organic sugar for brewing. 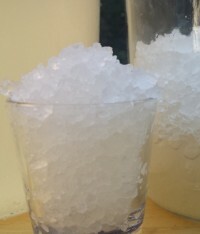 However, in the “hack” below, you’ll see McKinley’s technique for brewing GT’s flavors involves using fruit in the first ferment. Although kiwi is not listed, conceivably you could try juicing your own kiwi to try and recreate GT’s exactly. But beware! Kiwis are not easy to juice, and it might get expensive fast. Instead, using more juice friendly and readily available fruits like berries is an effective technique. Keep in mind that by cooking the fruit first, we are essentially pasteurizing the fruit sugar used for brewing. This means there should be very little if anything alive to create off flavors or mold, making it safer to brew with fruit. 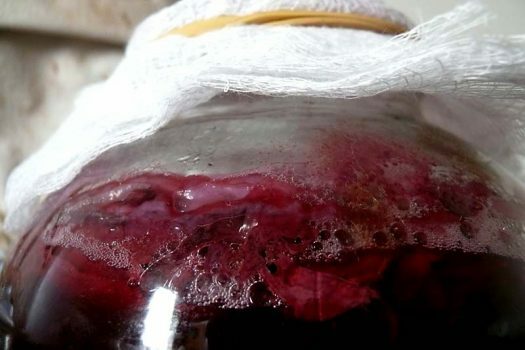 Still, always keep your fruit brewing SCOBYs away from your regular Hotel! 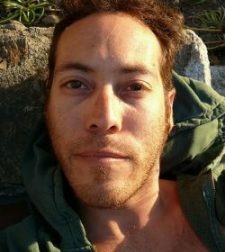 Please welcome guest poster and power home brewer McKinley Alvarez from Santa Cruz, CA! 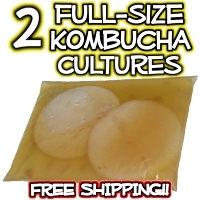 While we advise brewers never to use fruit during primary fermentation to protect the health of the brew, of course there are many ways to make Kombucha as the SCOBY is an extremely hearty organism. In that spirit, McKinley shares some ideas of how he makes his flavored Kombucha. Thank you Kombucha Mamma for inviting me to share my story! This is an honor since I consider you a critical resource to the Kombucha community. I hope my story will inspire people who may be afraid to try brewing their own Kombucha. I can’t imagine life without Kombucha. When I’m hungry but don’t have time to eat, I drink some Kombucha to keep me going for a couple hours. I also think it helps settle my stomach down too, but who knows, I’m not a doctor. I remember the first time I heard of Kombucha—it was at the Bikram yoga studio where I practice. Some people say Kombucha is an acquired taste, but I was hooked after my first bottle of Divine Grape. Oh my God, I had never tasted anything so refreshing. I got so hooked, a hippie friend of mine encouraged me to make my own. “No way can this make mine taste like the expensive GTs brand I’ve been buying,” I thought. 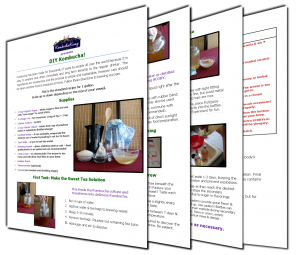 Remembering that Kombucha is an ancient Chinese tea, I researched how to brew my own on this very website. I decided I wanted to try making Strawberry Serenity or Divine Grape, my two favorite flavors. Time to Copycat GT Kombucha! I dove in and got a Kombucha SCOBY. I have to keep it simple: I use organic tea bags, I use frozen fruit, and my empty GT’s bottles (ed. note – if your GT’s caps are wearing out, try these replacements). Anything to save a penny. Something to remember though: Kombucha is only as good as the ingredients. Some fruit sources work better than others. Blueberries are pretty delicious no matter who grows them. Same with blackberries and I’m also pleased to report that I’ve had great success with frozen mango as well. At the yoga studio where I practice, 3 friends have begun to brew their own fruit flavored Kombucha. While their brewing methods are more traditional than mine, their results are fantastic—apricot/mango, pomegranate. It’s been a real treat to enjoy the brews my friends are making and each one is just amazing in its own way. That’s the exciting thing about Kombucha, there is a lot of room for experimentation. Imagine how they were doing it 3,000 years ago in China? It must have been the same way, a different brew on every block. 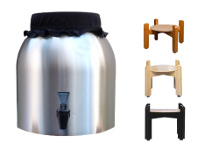 Interested in making fruit flavored kombucha in the brewing stage? Try this recipe, but remember, these are experimental techniques and may not brew a successful batch every time. ALWAYS use an extra SCOBY from your SCOBY Hotel when trying a new brewing technique. Add 6 ounces of fruit to 2-6 cups water and bring to a boil in a stainless steel pot. Remove from heat, add tea bags to pot. Add fruit/tea mixture to vessel. Fill vessel most of the way with purified water up to one gallon total. Leave at least 1-2 inches from the top for breathing room with purified cold water. Do not disturb for 5-7 days. Brewing Cycle may be reduced with this method. Since the fruit is in direct contact with the fermentation process, it is possible that the flavors may turn sour more quickly. 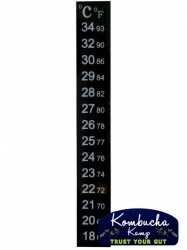 Monitor the brew closely and taste after only 4-5 days to gauge flavor/progress. Have you tried brewing with fruit? How about other non-traditional brewing techniques? Have you ever considered starting your own brand? I’ve been making my own Kombucha for a while now. Even received a Continuous Brew container for Christmas. I LOVE GT’s Multi Green but I haven’t been able to get it for the last several months. It has Spirulina and Chlorella in it. I have purchased a high quality Spirulina but haven’t found the Chlorella yet. How much per bottle would you suggest using? I’ve had good luck matching the flavor of GT’S by adding about 12mg of a zinc tablet to the secondary ferment in the bottle. Zinc may not be for everybody but it rounds out the flavor at the end and makes for a less acidic tasting drink. Don’t add too much and you don’t even need to smash the tablet since it will dissolved e on its own. I buy 50mg tablets and try to do about1/3 of a tablet per 16 fl oz bottle of kombucha. I’ve also used crushed egg shells and calcium tablets with good results. 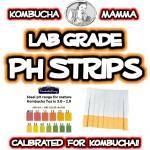 Balancing the acidity of the booch with alkaline minerals makes the drink much better in my opinion. Do some research cuz you may actually be lacking in a mineral that you need which you can add for balance. Google celestial salts and do some research on cell salts. You may be suprised to find that you’re lacking in silica or some other cell salt that you can easily add to the secondary bottle ferment. Premium black tea is also key. Something like golden monkey, golden yunnan black tea or silver needle white tea is amazingly good. Expensive stuff but really good tasting. Don’t skimp on good quality fruit either. Always get organic local fruit you can look at before you buy it. Make your own fruit concentrate by boiling down fruit with sugar to make kind of a fruit syrup then add it to your booth at bottling time. I am new to brewing, I’ll be doing my first batch today. But I love GTs Passionberry Bliss. Has anyone tried this, tastes so tropical. Does anyone have a recipe? I love reading all your comments!! So how would I make my favorite G.T.’s Synergy Grape Chia? Any ideas? Brand new to brewing! Love it though! Soak 1 TB for 20 mins until they plump, then stir into your Kombucha. Add grape juice and drink fresh! Chia seeds are best consumed as quickly as possible to maintain freshness. Thank you for all of the tips for brewing with fruit. I am wondering, do you have to rinse the SCOBY before using it in another batch. Would rinsing the SCOBY detract from its ability to ferment in future batches? I appreciate any thoughts or input. 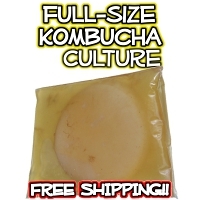 We do NOT recommend rinsing the SCOBY as that may deplete the yeast that cling to the culture thereby throwing off the balance between the yeast & bacteria. If you find there are quite a few brown clumps (yeast) clinging to the bottom, you may remove a few, but leave some so that you will have the proper balance & carbonation. I’ve been using the GT’s bottles too, but I have a major problem with them. I can’t get them open!!! I swear I’ve pulled a muscle in my shoulder trying to get them open. I’ve brought them to work to get other people to try. Still, nothing. Most of the time I can get them open, but I have two that I’m sure are going to be alcoholic by the time I get them open! I’ve started using quart size canning jars instead, this also works better for me since as soon as I open a bottle I want to drink it all. I recently did fresh pineapple and it was really good! Very fizzy. Also, watermelon turned out really well for me. I don’t do the brew mentioned here, I’ve been brewing for about two months so I’m still following Hannah’s directions to a T. 😉 Speaking of which, tonight I get to decant a batch, yay! The GT’s caps are oddly difficult to reuse. We have replacement caps available that hold in the fizz yet won’t break your arm when it comes time to open your bottle. Brew long & prosper Alicia! Where can you get hibiscus at? How long can I keep my bottle in the refrigerator? Becoz after 3-4 days, the taste is sweet less and acerbity, Could you help me. How can I fix it? Kombucha may be stored indefinitely. It does continue to ferment even in the fridge. We have found that storing sour Kombucha for longer periods of time allows a deeper 2ndary fermentation which shift the sourness into a drier flavor. If it is too sour, then dilute with water or mix with juice. I have a serious addiction to the Multi-green flavor. I have recently purchased a pound each of Spirulina and Chorella powder so that I could make my own. Does anyone have the recipe for that one? PLEASE???? Everybody has different tastes. The size of bottle, as well as how “green” you like it will be important factors to consider. Try adding 1/4-1/2 tsp of each to a 16oz bottle and then tweak the recipe from there. We also have Green Power Blend available for those who want a pre-blended “green” mix. Yep.. the old GT Synergy bottles work great! Here’s a hint for getting the labels off — put the bottle in the microwave for 25 seconds (this should loosen the label). Remove and pull off what you can. Wet whatever label is left on the bottle and put back in the microwave for 20 seconds. BE CAREFUL, glass may be very hot depending on how powerful your microwave is! At this point, the label should be very sticky and scrape off easily. I use a single-edged razor and some dish-washing soap to remove the rest. 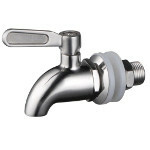 Remember to rinse well with clear water. Hope this helps. Great tip Tavit! Another way to remove the label is to pour hot water in the bottles, this loosens the adhesive from the inside and then you can gently peel the label off. Use caution, if the bottles are too cold, the hot water could cause them to crack. Just tried the hot water method today while at work. I didnt think it would work but I’m sick of buy Goo Gone 🙂 Filled it up with hot water from the machine and let it sit for 5-10 minutes and it peeled right off. Yay! Vinegar dissolves that label glue too. It’s great for getting those last stubborn bits off. i love this site. primed to make my first batch, i’ve been drinking store-boughts and am loving it. thank you all for your generous sharings of your kombucha wisdom. wow, these comments are so cool, totally love that ya’ll were thinking along the same lines as I was. this last month, i’ve been enjoying mango as well as peach, both super double plus good! Loved this! Thanks you. Getting ready to start brewing my own as I have to get our grocery bill down and my buch habit is costly. Plum juice is nice, even the stuff i have frozen from the summer time. or watermelon i wonder what that would be like. I think I am going to try the pink lemonade…Yummy. I am kinda hooked on ginger/vanilla. I am not a fan of the fruit ones but my husband likes strawberry and blueberry. I too like the GT bottles(I get the best fizz) & wish I could get my hands on more without buying their booch….I think mine tastes much better!!! 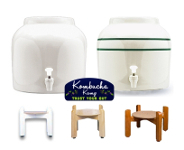 Thanks to Kombucha Kamp for all your great info!!! will definitely experiment with the “fruit brew” technique…so far have just been adding at bottle time. Current favorites are all the combinations of: lemon, ginger, raspberry and hibiscus. I think we’ve been using frozen fruit from TJs with decent results. Thanks for all the info! I’ve never brewed with fruit in that manner, but have added fruit to my final product which I store in old GT bottles as well 🙂 I’ve used fresh and frozen fruit… cranberries, grapefruit, lime, orange, ginger (quick way is with honey ginger crystals), blueberries, grape, strawberries, raspberries and even my fruity green smoothie containing spinach and kale (my bootleg version of my favorite GT brand… mega green), pineapple. anyhoo…I’ll give it a try soon!